Airwheel R3 Makes People Take A Fancy To Cycling. Abstract: Some people choose jogging in the open air, some take exercise in gym and some choose to cycle outdoor. Cycling regularly is good to improve physical quality and Airwheel R3 citizen e-bike makes people take a fancy to cycling. Whether jogging or exercising in gym, both of them will gradually whittle down people's passions because of monotonous modes. The advent of Airwheel R3 citizen folding electric bike radically smashes traditional exercising modes and makes people fall in love with cycling. Airwheel R3 provides a fascinating introduction to your living city's diversity. For the increasingly serious environment and traffic problems, a mass rapid transit system is even under construction in many cities that may finally help relieve the congestion and improve the environment quality. Airwheel R3 is better known for its multiple ride modes—electricity-assisted mode, power-assistance mode and bodybuilding mode. 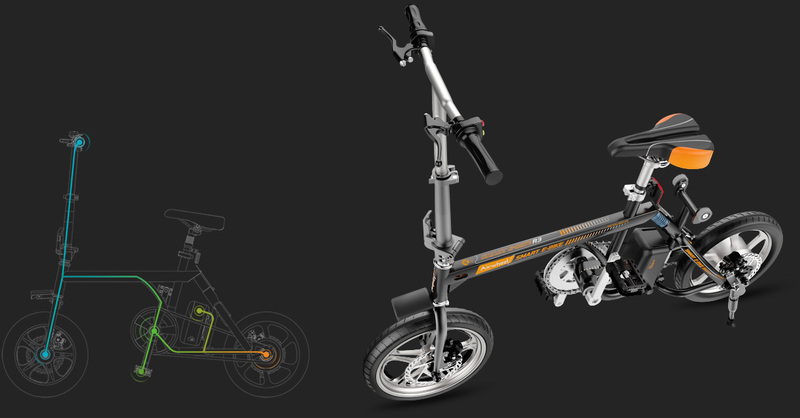 R3 mini electric assist bike can build up body in man-powered mode. Lots of people are attracted by the relaxing riding and easy control of Airwheel R3. They can ride R3 anywhere, such as on the streets, in the park, in the campus, in the backyard or even in the drawing room. During the riding process, the muscles of four limbs, especially two legs, can be fully exercised. Moreover, the backbone, balance ability and flexibility will have all-round training. People who have cervical spondylopathy and humpback will be corrected if riding Airwheel R3 E Bike often. If they feel tired, they can alter the mode to electricity-assisted mode. Just like other e bikes, R3 can be ridden without pedaling. Also, there is no worry for the range. It will provide different levels of power assistance based on the choice of gear and Riders are empowered to alter ride modes freely to enjoy more fun and to achieve 100 km range. Other than that, its battery is swappable and it takes a few seconds to disassemble and replace battery without any tools. Also, the USB interface in the battery on near the charging port makes the battery can be treated as portable power source. All in all, Airwheel R3 smart e bike not only makes exercise more interesting, but also makes people healthier. Next：What Intelligent Technologies Are Applied To Airwheel F3 Unmanned Aerial Vehicle?